The months of March and April are especially unique at 21st Century Cyber Charter School. That’s because our students are required to take state standardized tests. While every public school student in Pennsylvania takes these exams each year (depending upon grade level) the distribution of these tests is wildly different for a brick-and-mortar school. When you are a cyber school, these months are dedicated to preparation and organization. We must then move ourselves all across the commonwealth to meet with our students and proctor the exams. 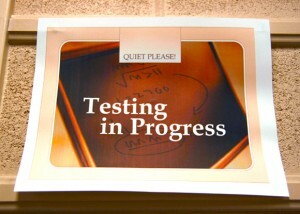 For traditional brick-and-mortar schools, times of standardized testing create a particular buzz in the building. For the most part, schedules are altered, and teachers are pulled in different directions to help accommodate proctoring needs. When the tests arrive, there are checklists to be checked and orders to follow to ensure that each test is administered correctly. Our technology department travels to each testing site to check on internet connections, bandwidth availabilities, server capacities, and more. We are utilizing a fully online version of the PSSA and Keystone exams this year. Therefore, each site we use for testing needs a mark of approval from our tech team, assuring us that our students will not have trouble logging into their tests, scrolling through them, and saving their responses. This year, we are testing at colleges and universities, to ensure that enough bandwidth is available to properly run the tests. While tech runs across the commonwealth, teachers and staff are required to complete a training program, provided to us by the state education department. It shows us how to properly administer, collect, and resend the tests back to the state. It takes us about 45-60 minutes to read through the training materials provided to us. We watch videos and learn how to be of service to students while they are testing. Then, we take quizzes to be sure we understand what to do. See! Even teachers keep learning, and testing! Come the weeks of testing, teachers are all set to get to their sites to proctor. We make hotel and rental car arrangements, pack our bags, and load up supplies to successfully distribute the exams. Some teachers travel four or five hours, and stay in a town they have never before visited. It is an exciting opportunity for us to see new things and the students we might not normally see. By the time March floats around, the look of our building at 805 Springdale Drive, changes drastically. Long gone are the busy cubicles, noisy teachers, phones ringing, and mouths chattering. Our teachers are divided between the various testing sites, eager to set up your tests and see your smiling faces. Being cyber school teachers, we only see you at field trips, community outreach events, or tutoring opportunities. However, because standardized tests are mandatory (every single student in grades 6, 7, 8, and 11 must take them) we get a chance to see everyone! Good luck to everyone as you prepare for these tests! We’ll see you on the road!